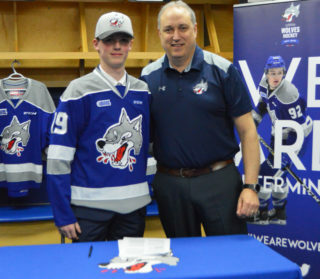 (Greater Sudbury, ON) The Sudbury Wolves Hockey Club are pleased to announce the addition of Kirill Nizhnikov from the Barrie Colts in exchange for the 2018 3rd round draft choice from Owen Sound, the 2019 5th round selection from Hamilton and the 2021 and 2023 2nd round choices from the Wolves. Nizhnikov was the 7th overall pick in the 2016 draft by the Mississauga Steelheads before being traded to Barrie for a slew of draft picks, 10 in total, before the 2016-17 campaign began. Fans will get their first chance to see Kirill play at home during the Teddy Bear Toss game in support of the TD Toy Bank and Salvation Army at the Sudbury Arena on December 15th. Before then Kirill will join the Wolves Thursday morning in Peterborough for a skate with the team while he joins the Eastern swing this weekend. Fans can follow the Wolves on the road in a number of different ways this season. Fans can listen to the live play by play on CKLU or mxlr.com on the Sudbury Wolves App or watch on Eastlink Channel 10 and HD 610 when they can see Kirill for the first time in Kingston vs. the Frontenacs on Saturday night at 7pm before again on Sunday afternoon in Ottawa at 2pm.